The origins of glassmaking in Venice go back to the times of the Roman Empire when molded glass was used for illumination in bathhouses. Blending Roman experience with the skills learned from the Byzantine Empire and trade with the Orient, Venice emerged as a prominent glass-manufacturing center as early as the 8th century. One of the earliest furnaces for glass on a Venetian island, dating from the 8th century, was discovered by archaeologists in 1960. 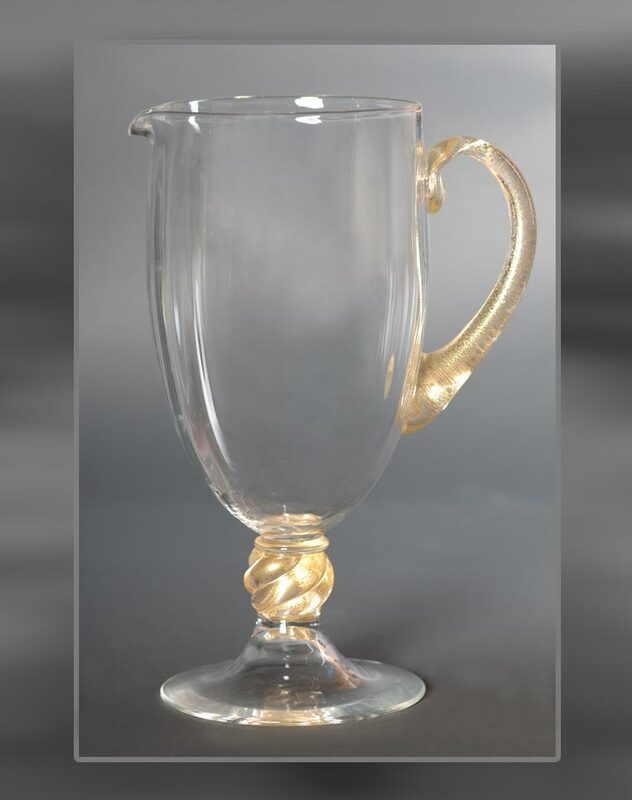 By the late 1200s, the production of glass objects of the finest quality was the city�s major industry as confirmed by the establishment of the Glassmakers Guild that laid out rules and regulations for the craftsmen. The purpose of the guild was to safeguard the secrets of the trade and ensure the profitability of the industry. In line with these objectives, a 1271 law prohibited the importation of foreign glass or the employment of foreign glassworkers. An even more radical law was passed in 1291 that laid the ground for the establishment of Murano as a premier glass-manufacturing center. This law required that all furnaces used for glassmaking be moved from Venice to Murano to avoid the risk of fire from the furnaces spreading onto the largely wooden structures of overpopulated Venice. Many historians agree that the true motive for this law was to isolate the glass craftsmen to a location where they wouldn�t be able to disclose trade secrets. A subsequent law passed in 1295 forbidding the glassmakers from leaving the city confirms this theory. Artisans working in the glass trade were well rewarded for their efforts. They had a privileged social status, and their daughters were allowed to marry into the wealthiest and noblest of Venetian families. By applying this clever approach, Venetian government ensured that the glassmakers encouraged their offspring to carry on the trade, and that trade secrets stayed in the families and fueled creative processes leading to innovation and further success. This, along with Venice�s convenient location at the crossroads of trade between East and West, gave Venice monopoly power in manufacturing and selling quality glass throughout Europe that lasted for centuries. 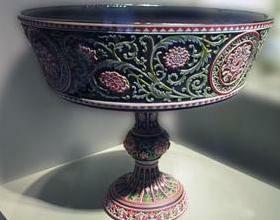 Venetian glass reached the peak of its popularity in the 15th and 16th centuries. In the 15th century, master Angelo Barovier discovered the process for producing clear glass - (cristallo) - that allowed Murano glassmakers to become the only producers of mirrors in Europe. In addition, the popularity of Chinese porcelain among European nobility fueled discovery and production of the white glass mimicking porcelain (lattimo). Other types of glassmaking techniques became popular such as enamelling and gilding glass, which originated in the Middle East, filigrana glass which is made using glass rods with inner threads of white, golden or colored glass that are twisted or intersecting, and ice glass which appears finely crackled. Variety of shapes and colors increased, and glassware became more sophisticated though the beauty was still viewed as the simplicity of shapes and ornaments. Starting from the 17th century, Murano glass entered the period of gradual decline. As Venetian power grip on trade routes and its importance as a major center of commerce began to vanish, so did its monopoly power in glassmaking. New centers of the craft emerged in Bohemia, England, and France. Yet 17th century still saw innovation in Murano glass as new techniques continued to emerge driven by strong baroque trends that spread through European architecture, painting, interior decoration, and other art and craft forms. Brightly colored, intricate glass decorations with floral and animal motives became popular. New glass techniques included avventurina (metal flecks embedded in glass for a sparkly look) and calcedonio (illusion of semiprecious stones), raised decorations on glass, and millefiori beads. These new techniques were so successful that even royal courts ordered glassware from Murano artisans. One example is King Frederick IV of Denmark who in early 17th century purchased a glass collection that is currently on display at the Rosenborg Palace in Copenhagen. In the 18th century, the decline continued and was aggravated by worsening political climate and increased competition from the glassmakers in Bohemia and France. Some new techniques were introduced, such as engraving on glassware and mirrors, but they did not make visible impact. The industry shrunk drastically with Napoleon�s conquest of Venice in 1797 and his abolishment of all of Venice�s guilds, including the Glassmakers. In 1814, the transfer of Venice from France to the Habsburg Empire spelled the ultimate death sentence to Murano glassmaking as Habsburg rulers preferred their native glassmaking center in Bohemia and passed laws making it prohibitively expensive to bring necessary raw materials into Murano and export the final product. As a result, almost half of the 24 furnaces that existed in Murano in 1800 shut down by 1820, and only 5 furnaces continued to produce blown glass. However, against all odds, the industry didn�t die completely ? it was kept alive by the artisans� personal dedication to their centuries-old craft and their father�s hard work that once made Murano glass world famous. The breakthrough came in 1854 when six Toso Brothers opened the firm Fratelli Toso that initially produced household glass items and window panes but then switched to reviving forgotten techniques of the past. Five years later, Antonio Salviati came to Venice from Vicenza where he practiced law to open a factory dedicated to production of traditional Murano glass. He saw an opportunity to revive the craft by producing tiles that could be used to restore old Venetian mosaics, and he hired the best Murano masters to work in his factory. One of his glassblowers, Lorenzo Radi, spent much time during Austrian rule rediscovering the old methods and techniques that were used to create old Venetian mosaics. Salviati�s plan worked, and Venetian authorities soon signed a fifteen-year contract with his firm for restoration of the mosaics in St.Mark�s basilica. At around the same time, in 1861, Venice mayor Antonio Colleoni and abbot Vincenzo Zanetti decided to compile an archive dedicated to the history of Venice containing not only various writings but also objects of art produced in the city. Gathering of the objects for the archive caused renewed interest in Venice�s history, its past glory, and its famous crafts including glassmaking. This in turn prompted officials to set up a school for glassmakers where they were able to learn again the forgotten techniques and secrets of the craft. The culminating event in reviving Murano glassblowing was the exhibition set up by the Archive in 1864 to display all the recent glass works and reignite competitive spirit among the craftsmen. On the heels of that exhibition were other international shows, such as the highly successful Universal Exposition in Paris in 1867 where Salviati exhibited over 500 works made by his firm and received international acclaim and multiple medals. This success and publicity led to complete revival of Murano, which once again became a booming economic center, employing 3,500 people by 1869, and a famous destination. In the beginning of the 20th century, the master glassmakers of Murano were still enamored with reproducing classical styles and rediscovering ancient techniques, which was evident at Murano and Venice Exhibition of Choice Glass and Glass Objects staged in 1895 inside Murano City Hall. The rules of the exhibition dictated that the works showcased be reproductions of antique glassware. This important event was well attended by international collectors and glass admirers who greatly appreciated the works rooted in unique Murano tradition. The best works of Murano artists were on display; many were a product of an important glassmaking technique called Murrino (mosaic), which was rediscovered at the end of the 19th century by Vittorio Zuffi while working for Fratelli Toso. This technique originally emerged in the 16th century in an effort to imitate ancient Roman vases. Murano�s famous firm Artisti Barovier received the Honorary Diploma and the Gold Medal. Other artists enjoying popularity in Murano at the time were Salviati, Testolini, and The Toso Brothers (Fratelli Toso). The year 1895 was also the time of the first Venice Biennial exhibition where new works of art in avant-garde and art nouveau styles were showcased. This highlighted the gap between the modern trends gaining strength in Europe at the time and the works of Murano artisans who were deeply attached to the styles and methods of the past. This gap became even more obvious at the Universal Exposition in Paris in 1900, followed by Expositions of Decorative Arts in Turin in 1902 and Milan in 1906. Some Murano artisans, like Vittorio Toso Borella, became receptive to the new winds blowing on the art scene and started to produce works in art nouveaustyle. Though he originally got mixed reviews for the works he exhibited at Ca� Pesaro in 1909, Vittorio went on to produce masterpieces that later became universally appreciated. Ca� Pesaro, unlike Venice Biennial, became an exhibition embracing new artistic trends and showcasing many works in art vouveau style by young artists such as Gino Rossi, Arturo Martini, and Guido Marussig. One of the artists, Vittorio Zecchin, collaborated extensively with Artisti Barovier to create designs for their famous glassware. In the 1920s, art nouveau slowly got replaced by more modern styles with simpler, cleaner, and more functional designs. Art deco took the center stage and with it came less decorated objects with softer lines and more focus on glassware as part of interior design, not a piece of art in and of itself. A new company, Vetri Soffiati Muranesi Capellin Venini, founded in 1921 under Vittorio Zecchin as its head designer became the champion of this style. A little later, in the late 1920s to early 1930s, another important trend arose in Murano led by Maestri Vetrai Muranesi Capellin & Co. and Vetreria Artistica Barovier. The trend was glass animals, which remain popular even today. 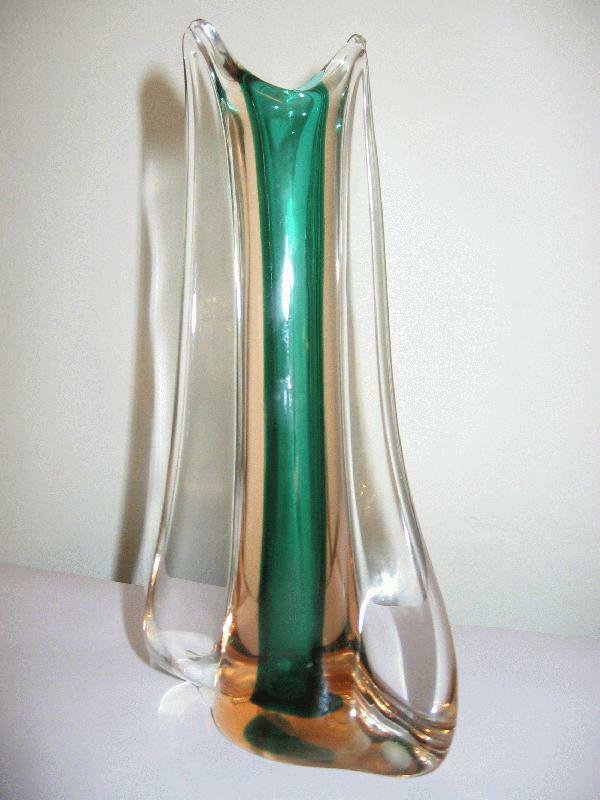 Other important innovations championed in 1930s and continued in early 1940s were production of glass statues of female nudes and classical figures of boxers and gods, engraving on glass, modern lighting fixtures, perfectly proportioned transparent glass tableware, and the invention of vetro sommerso ? a technique allowing to produce thick glassware with one color on the outside and another on the inside. During World War II the industry did not thrive, but as soon as the war was over the glass masters of Murano returned to their art and created pieces deeply rooted in interior design trends of that time with focus on minimalism, functionality, and simplicity. To support these trends Murano artists and artisans returned to techniques of the past such as filigree, murrino, and lattimo. From that point onwards Murano saw continued exploration of styles and techniques striving to find a happy medium between the technical mastery and the outline, color, and decoration. The resulting continuous innovation led to a rise in popularity and to multiple prizes at various international art exhibitions. Thanks to such prominent artists as Archimede Seguso, Ludovico and Laura De Santillana, Tobia Scarpa, Ercole Barovier, Fulvio Bianconi, Toni Zuccheri, Romano Chrivi, Giampaolo Martinuzzi, and Alfredo Barbini, Murano again became known as the glassblowing capital of the world. 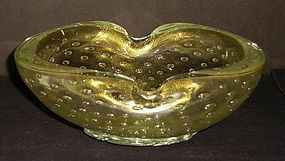 Murano now created the art trends as opposed to following them in the years past. Glass is a solid matter which, in its raw state, is made of siliceous sand, soda, lime and potassium melted together in an oven at a temperature of 1500�C, to become a flexible material. Then, in the simplest scenario, the glassmaker removes this substance from the oven with the help of a pipe, and shapes it using various specialized instruments that changed little since antiquity, such as pliers, scissors and wooden shovels. "Glass-blowing" refers to a method of blowing inside the pipe to give the glass object a form. The magnificent appearance and coloring of Murano glass is achieved by adding gold or silver foil to the glass mixture and/or adding minerals such as zinc for white, cobalt for blue, manganese for violet, and so on. Once the object is finished, it is placed in a cooling oven, called "tempera", to cool down slowly; in this way it doesn't break due to the extreme variations in temperature. 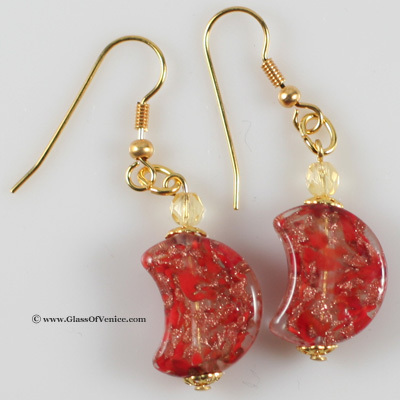 Clear glass that features metal particles embedded into it to create a shimmery, sparkling look. The particles are made out of copper or other metal oxides. This manufacturing process is very difficult, and has been invented in the seventeenth century. It is said that avventurina glass was invented by accident when a Murano glass maker spilled copper filings into the glass he was working. The glass that resulted from that lucky occurrence was named avventurina - from Italian word "ventura" (translated as "fortune" or "chance"). Glass which is decorated with a regular pattern of evenly spaced air bubbles that become gradually larger or smaller. 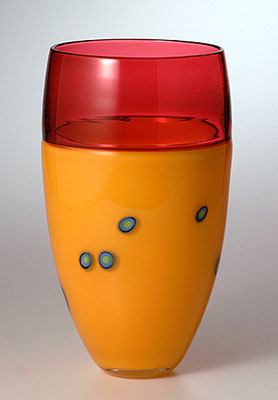 This widely used art glass technique was especially popular with Murano glass artists during the 1950s. Glass featuring polychromatic veins running through the dark-colored glass. This look is obtained by mixing various metal compounds in a certain fashion, to imitate the natural stones such as chalcedony, agate, and malachite. It was known and used in ancient Egypt, and then re-discovered in Murano in the fifteenth century. The secret of the technique was then lost again and subsequently re-discovered by Lorenzo Radi in the later part of the 19th century. Extraordinarily difficult technique which consists of first fusing two glass layers of different colors, and then raised-carving the object to create a design based on revealing portions of the underlying colors . The first known examples of the use of this technique date back to first century A.D. The technique was particularly popular in early 20th century in Britain. One of the best known examples of this technique is The Great Tazza - an elaborate ornate bowl that is based on five layers of different colored glass. The piece was presented to much amazement at the 1990 Paris International Exhibit. Venetian crystal is the first truly colorless glass, invented in 1450 by Venetian glass master Angelo Borovier, and obtained by bleaching glass mixture using manganese or other decolorants. It is a fragile sodium-based glass, and is best suitable for manual etching. 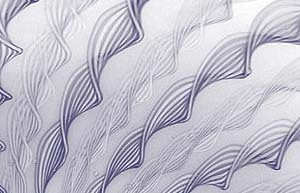 'Fenicio' (Phoenician) is a technique used to produce festooned motif on glass. It was adopted in Murano at the end of the 17th century, though it was used on glass as far back as the 2nd millennium AD. To achieve this decoration, the glassworker wraps the incandescent glass threads with a thin pontil, or "speo", and then while the object is still hot, he combs the threads with a hooked tool, called a "maneretta". Then, once the threads are merged into a single piece of glass, the obtained decoration is similar to festoons or feathers. Filigrana is a name used to describe several techniques to create glass formed by colorless or white rods with inner threads of white, golden or colored glass. The technique is called "reticello" when the threads cross and form a grid, where small air bubbles form in between the threads. Glass is called "a retorti" or "retortoli" when threads form a spiral pattern and do not cross. This is one of the most ancient techniques, that has been in use as early as the sixteenth century. The term comes from the Italian for "ice". This kind of glass appears cracked on its entire surface. This effect is obtained by immersing still hot shaped glass object in cold water and then covering the crackles with another layer of glass. It was very popular from the 16th to the 18th centuries. This results in a finely-crackled glass surface similar to crocked ice. An ancient glass technique requiring a particular dexterity from the master performing it. It is used to create objects formed by separate parts blown one at a time, usually of different colors, and then joint together while still warm, and shaped to the desired form. (From Italian "latte" - milk). 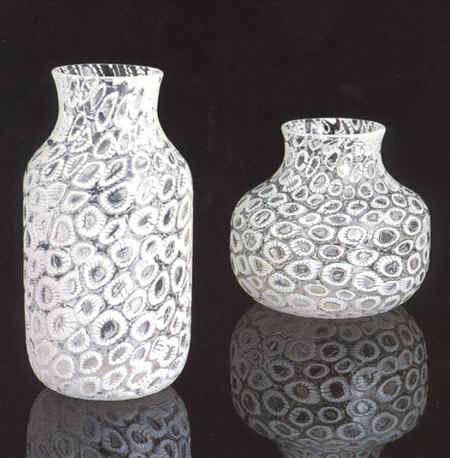 Opaque white glass produced for the first time in Murano in the fifteenth century, imitating the look of fine china. 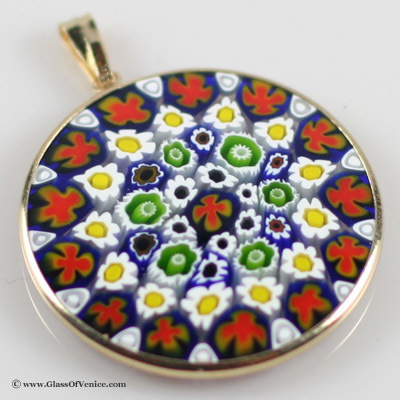 It was originally used for manufacturing objects decorated with multicolored enamels. (From Millefiori - "a thousand flowers"). The basis of this technique is the use of glass canes (rods) which contain a single flower design visible only on the surface of cross sections of the cane. The object is then formed using the cross-sections of multiple such rods, which are melted together to cover the surface of the glass object. This technique was first used in Egypt between the third and the first century B.C. (From Italian "Sommerso" - submerged). Creates a layered appearance where one colored layer of glass is covered by another layer of differently-colored glass. 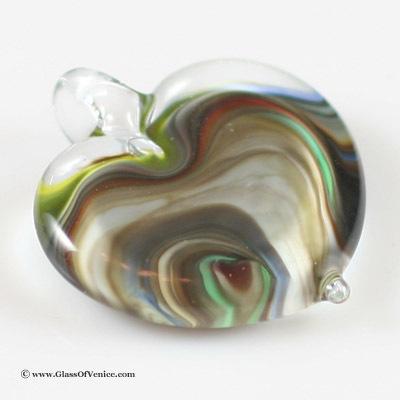 This effect is achieved by repeatedly dipping a glass object into molten glass of another color. This technique was invented in Murano in 1930's. Copyright © 2010 MuranoGlassWorld. 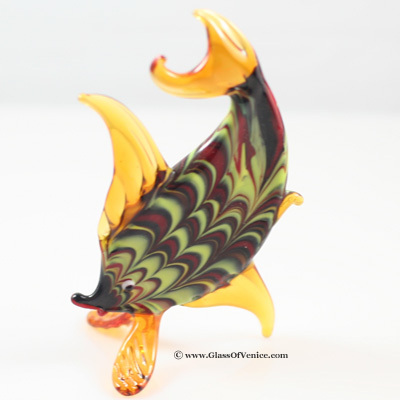 Exquisite murano glass wholesale.